In just a few clicks get your official Tajikistan Evisa. No other visa application is necessary. to get your Tajikistan Evisa! Fill out the form with the information provided on your passport. Visa fees are payable online by credit card. Your official eVisa Tajikistan will be sent by mail. 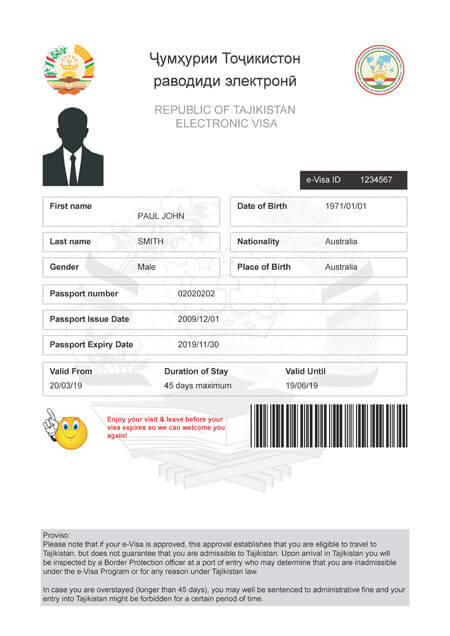 It is now much quicker and easier to obtain a tourist or business visa to go to Tajikistan. No need to wait long queues to get your visa. A more convenient option, you can now simply in just a few clicks, apply online to obtain your Tajikistan eVisa. You will need to fill the form and make the payment with a credit card and you will receive your electronic tourist visa via email. The visa we offer is for a tourist visa. This visa is issued for a single entry and will be valid for a period not exceeding 45 days for the purposes of tourism, holidays, visits, recreation, short-term health care or any other legally recognized activity by the law of the Republic of Tajikistan. The application and delivery for this visa are done online, no need to go through embassies or other associations. It should be noted that possession of a Visa is not a final guarantee to enter the Republic of Tajikistan. The immigration officer at the port of entry may refuse the entry of a visa holder if he considers that his holder is unable to fulfill the Republic of Tajikistan immigration entry requirements or if the presence of that person or visitor in the Republic of Tajikistan would be contrary to national interests or security. Travelers wishing to visit Tajikistan must apply for an online visa. Travelers must apply at least 72 hours before their trip to Tajikistan. Authorization Granted: Your trip is authorized and your visa will be issued by the relevant services upon your arrival in Tajikistan. Travel Not Permitted: You will need to apply for a Temporary Stay Visa from the Tajikistan Embassy in this case. Please note, that only the short stay visa will be processed by our system. LIST OF COUNTRIES WHOSE NATIONALS DO NOT REQUIRE A VISA. *Nationals of China holding passports for public affairs do not require a visa for a maximum stay of 30 days. Holders of diplomatic or official/service passports of Brunei, China, Hungary, India, Iran, North Korea, Pakistan Romania, South Korea, Turkey and holders of diplomatic passports only of Afghanistan, Turkmenistan and Uzbekistan do not require a visa for Tajikistan. tajikistan-evisa.com is intended to accompany the natural and legal persons in their paperwork travel. tajikistan-evisa.com is not linked to the government website of Tajikistan (www.evisa.tj). The price charged 75 Euros covers the costs for the immigration services ($50) and 95 Euros for applicants requiring a GBAO permit ($70) as well as the help and assistance of EVisa Tajikistan for the duration of this E-Visa. Klik and pay does not take the responsibility of any issues related to the services provided by this website. For all inquiries, please send an email to support@e-visa.online.